January 31 – Spanish authorities have reopened proceedings into the bizarre and still seemingly murky case of the liver transplant undergone seven years ago by former French international defender Eric Abidal, saying new evidence has come to light suggesting a trafficked organ was used. Last year claims that embattled former Barcelona chief Sandro Rosell illegally bought the liver for Abidal were vehemently denied by the club and roundly condemned. 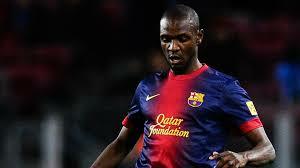 Abidal, who is now Barcelona’s sporting director, has long insisted the donor was his cousin Gerard Armand. But according to agency reports, a Barcelona judge found “it had been proved that there was new evidence against those investigated, so that the case can be reopened”. The judge, who previously shelved the case because of a lack of evidence, asked for it to be reopened due to alleged “irregularities or discrepancies” in the clinical history, according to a court order seen by Reuters. That, in the judge’s opinion, constitutes “sufficient evidence of the alleged commission of the offence at the heart of the investigation” and justified the continuation of investigations, such as the summoning of Armand as a witness. Abidal has previously spoken of his “annoyance and sadness” regarding the claims and said Armand had donated his liver in 2012 “to save my life”. The cousin said he had not received anything, “not a centime”, in exchange.